One of the key tenet of Power BI Custom visualization is to unlock the creativity and allow developers to build insightful visuals which could be domain specific. Shopping behavior analysis is very common in ecommerce domain. You can draw parallel to many similar processes in other domains as well. Brad Sarsfield built a custom visual for this purpose based on terrancesnyder’s block #227e02f3e2c8eef23f96. 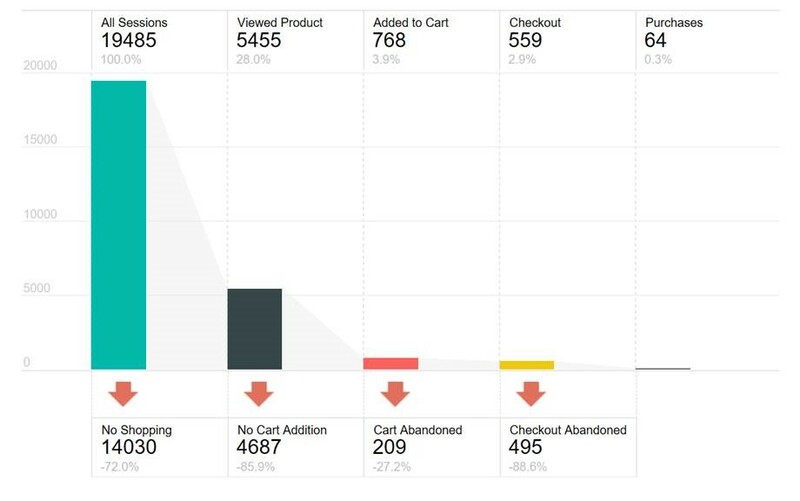 Besides the fact that this visual looks awesome, the true awesomeness is about the specificness of this visual and not be content with a standard bar chart or funnel chart or Sankey to visualize this flow. In fact, It’s mixes all the three and makes it specific to this type analysis, topped with visual awesomeness. The Sankey Bar Chart creates a high level data visualization to show both conversation and drop-off metrics for a process flow, like a website shopping experience. This visual describes and shows the flow between different states. When we are trying to figure out the user action and drop-off, having an understanding of exactly where to focus the effort to improve what’s being measured, is critically important. At the core of this visual is the connected bar chart. It allows us to see and quickly visually compare each of the stages. The Sankey aspect of the chart visually connects each of the bars in the chart and emphasizes the relative comparison between each of the bars. The steeper the connection, the higher the relative drop-off and lower conversion between each point. The visualization reads much like a funnel diagram and explicitly calls out the absolute and relative conversion metrics at each stage. By quantifying the differences between each of the stages in our process we can prioritize the action that we would take to change the numbers and improve sales, customer happiness or other similar business level metrics that we can track. To use, simply download Sankey Bar chart from the visuals gallery and import it to your Power BI report and use it.